Indiana was able to avoid the slow starts that have plagued it so often in recent weeks. The Hoosiers played with a ton of energy in the early going, following the lead of Juwan Morgan, who was everywhere on the boards. Morgan grabbed several rebounds over and around bigger Spartans players and Indiana took an early lead. Romeo Langford was aggressive early, scoring a couple of baskets inside, and the Hoosiers were in front 13-9 at the under-12 timeout. At that point, the Spartans were in the middle of a scoring drought that eventually stretched for more than six minutes as Indiana shut down the fast break and rotated well defensively. The Hoosiers had some chances to open a bigger lead, but they went cold as well and did not score for more than five minutes as the game slowed into a defensive struggle. Michigan State recovered and went in front, but the Hoosiers continued to make some noise on the glass and used that energy to stay within striking distance. A major factor was the play of big man De'Ron Davis, who returned to the floor for the first time in four games. He battled with the Spartans' Nick Ward in the post and scored a couple of big baskets at key points, showing few ill effects from his injured ankle. Davis' presence became even more important near the 6-minute mark, when Morgan dove on the floor for a loose ball and got his arm tangled. Indiana's second-leading scorer and leading rebounder immediately grabbed his shoulder in pain and eventually walked off the court straight to the locker room. He did not return for the rest of the game after injuring the same shoulder on which he had surgery as a freshman. Morgan came back to the bench midway through the second half. Despite the loss of their emotional leader and one of their two best players, the Hoosiers refused to go away. Davis and freshman Jake Forrester were able to hold their own in the post late in the first half and the Hoosiers were down just 31-28 at the break despite shooting only 31 percent. The teams traded baskets early in the second half, with Indiana hanging around, but the Spartans continuing to hold a slim lead. With about 15 minutes left, Al Durham and Devonte Green got to the basket on back-to-back possessions for a dunk and a layup, respectively, that drew the Hoosiers within two. Two possessions later, Durham drilled a huge 3 from the right wing to give Indiana a 44-42 lead with 12:57 left. Michigan State immediately went back in front on a 3 from Kyle Ahrens, however. During this back-and-forth stretch, Indiana continued to play as hard as it has all season, diving all over the floor and getting physical under the boards. The 3-pointer from Ahrens kicked off a 10-2 run for the Spartans that helped them open up their largest lead of the game at 52-46. Michigan State guard Cassius Winston completed the run with a 3-pointer that drew one of the largest cheers from the Breslin Center crowd. 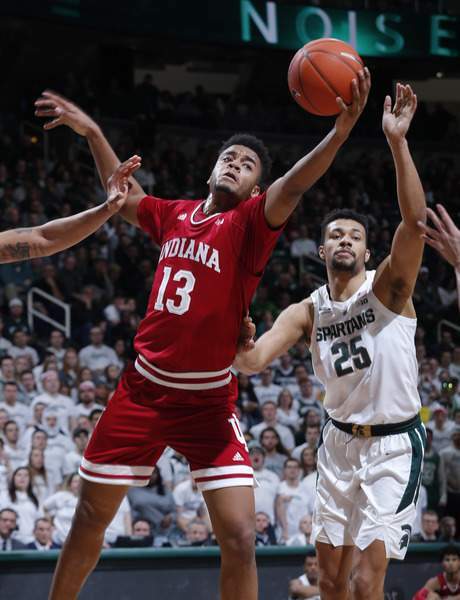 The Hoosiers struggled offensively as Michigan State opened up a slight cushion, with Romeo Langford in particular struggling to get his shot up. He had a layup and a jump shot blocked on back-to-back possessions. Michigan State could have extended its lead further, but the Spartans couldn't convert from the free throw line. The Spartans missed four straight free throws, giving Indiana a chance to climb back into the game again. Indiana did just that and Green and Durham hit 3-pointers on back-to-back possessions with 6:30 to go that pushed the Hoosiers back in front 56-54. Both shots were from several feet beyond the 3-point line. Of course, because the injuries can never stop for Indiana this season, Durham had to leave the game with what appeared to be a hand injury just two possessions. He went to the bench screaming in pain after Forrester hit that hand while going up for a rebound. Indiana continued to lead after Langford and Green each hit deep 3s to make it 62-60 with 3:58 left. That made it four straight Indiana possessions to end with 3-pointers. Durham later returned to the lineup with some protection on his finger and the Hoosiers continued to lead as the clock crept under two minutes. The game went back and forth thrillingly down the stretch, with Langford scoring on a tremendous drive to the hoop with 30 seconds left that put the Hoosiers in front 66-65. It was an iso play for Langford, who went to his right hand and tumbled to the ground after banking the ball off the glass and in. Nick Ward tied the game with a free throw with 18 seconds left and Langford missed a 3 at the final buzzer, sending the game to overtime. Indiana went in front in the extra session when Langford drilled a 3 on a broken play with the shot clock winding down. That made it 71-70 and the Hoosiers didn't trail again (until the closing seconds). The Hoosiers pushed their lead to four with 57 seconds left and then forced a stop and Green grabbed the rebound. Indiana could have put it away then, but Green lost the ball going up the court and turned it over. Winston nailed a massive 3 to bring his team within one and then Langford turned the ball over again with a bad pass on the ensuing inbounds play. It looked like the Hoosiers might give the game away, but Winston missed twice in the final seconds, including one on a huge block from Justin Smith, and Davis grabbed a huge couple of rebounds to seal his team's biggest win of the season. Green returned from being suspended for three games and helped spark the Hoosiers to a massive upset win. The junior guard scored 11 points on 4 for 8 from the field and 3 for 4 from beyond the arc. He hit two huge 3s down the stretch in regulation that helped put Indiana in front and played solid defense most of the afternoon. He added five rebounds and five assists, a block and a steal. ESPN's College Gameday was at the Breslin Center for the game. ... Indiana avoids its first eight-game losing streak since the end of the 2010-11 season, when the Hoosiers finished with nine losses in a row. ... Michigan State loses its second in a row after a 13-game win streak. The Spartans came in undefeated at home (10-0). ... The win is Indiana's first against a top 10 team in eight tries during Archie Miller's tenure. ... Michigan State came in No. 2 in the country in average rebound margin at plus-10.4, but the Hoosiers outrebounded Michigan State 48-40. Smith led Indiana with 10 rebounds and added 13 points. ... Michigan State went 8 for 22 at the free throw line. Nick Ward was 1 of 9. ... The Spartans came in No. 1 in the country in assists per game and dished off 23 assists on 29 field goals. ... Indiana shot just 39 percent from the field. The Hoosiers came in shooting 19.4 percent from beyond the arc in its last six games, but went 10 of 20 from deep, including 6 for 9 in the second half. ... Langford came in sixth in the conference in scoring at 17.3 points per game, and had 19 points on 6 of 18 from the field. ... Davis returned from his ankle injury and had 12 points and six rebounds in a season-high 25 minutes. ... Evan Fitzner made a second half 3-pointer that snapped a streak of 13 straight misses from beyond the arc that stretched back to Dec. 19. ... Michigan State had 14 blocks, including eight from Kenny Goins. The Hoosiers are back in action Thursday, when they take on Iowa (17-5, 6-5) at Assembly Hall. The game will tip off at 9 p.m. and will be broadcast on ESPN. The Hawkeyes have won five of their last seven, including a big 74-59 upset of No. 5 Michigan in Iowa City on Friday. They will have five days off before they face the Hoosiers.